Craving gingerbread but don't have time to make those cute little gingerbread men? 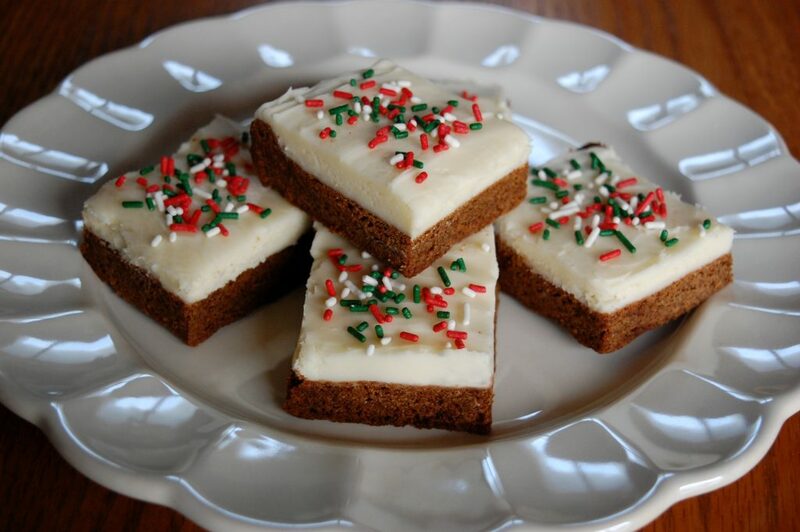 Try our quick and easy bars topped with cream cheese frosting, you’ll be glad you did! Preheat oven to 350 degrees. Spray a 9x13-inch baking pan with nonstick cooking spray; set aside. BARS: In a large bowl, whisk together flour, soda, salt, cinnamon, ginger, cloves and nutmeg; set aside. In a large bowl, using an electric hand mixer beat butter, sugar, brown sugar, molasses, and vanilla on medium speed until smooth and creamy. Add the egg beat until completely incorporated. Add the dry ingredients to the wet ingredients, beat until combined. Spread the dough into prepared pan, using clean hands or a rubber spatula to press the dough to the edges of the pan. CREAM CHEESE FROSTING: In a large bowl, beat the butter and cream cheese together until well combined. Add half the confectioners’ sugar, beat until well combined. Add the remaining half confectioners’ sugar and vanilla. Beat on high until light and fluffy. 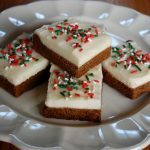 Once the bars have cooled, frost with cream cheese frosting. Cut into squares and serve.